Poet and playwright Joanna Imogen Davidson serves as Poetry Editor for Treehouse literary magazine. A native of Wilkes County, NC, she can’t help but draw from her Appalachian heritage and accent even though she’s lived in other parts of the state most of her life. 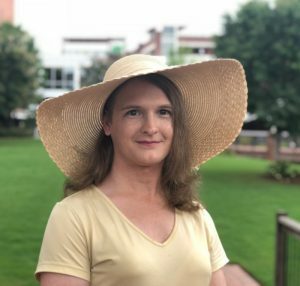 She is a queer, transgender, southern belle Virgo with a passion for hats (over 70 currently), who more recently freelances as a writer and IT consultant. She volunteers with the North Carolina Harm Reduction Coalition and helps run the Trans & GNC Closet at the LGBTQ Center of Durham. Her poems have appeared in the anthologies Witness: Appalachia to Hatteras and Heron Clan IV. Davidson also is a member of the North Carolina Poetry Society. “Poetry provides a medium for diverse voices that may not otherwise be heard primarily because various poetics draw us into an intersection with a poem itself and whatever it evokes. From there, a poem reveals new roads that encourage us to try out new techniques, expand knowledge, voice beliefs and emotions we didn’t have words for and relate to others better”.